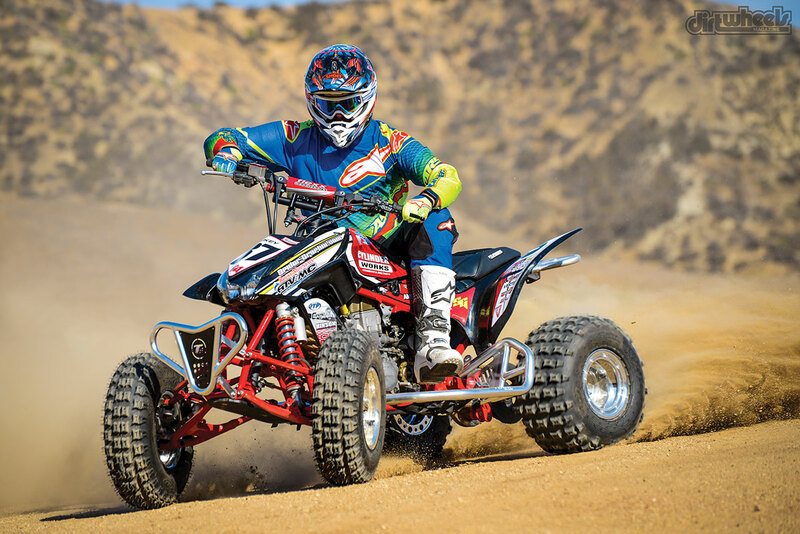 With many ATV manufacturers not producing sport ATVs any longer, many riders are having to hold onto older quads and rebuild them to as-new condition. 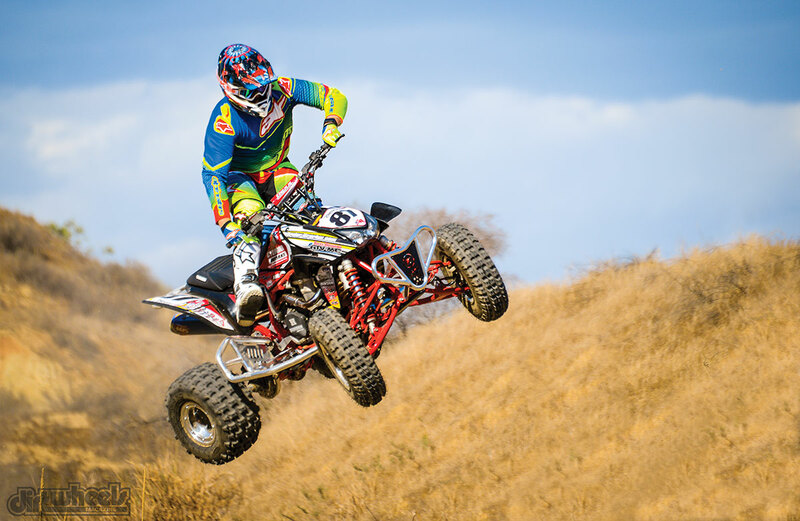 Luckily, there are many ways to use aftermarket parts to rebuild your older sport ATV into something that is better than what you could pick up on the dealer-room floor. The project can even be at a cheaper cost if you don’t go crazy with your build. We recently had the chance to resurrect a 2004 TRX450R that had a blown engine and needed much love to get it back to like-new condition. It is always rewarding taking a basket case and completely transforming it into one of the coolest quads on the trail. We did just that with this build. This particular quad was hurting from the inside to the outside. It was ridden in the red dirt of southern Utah for years, and the dirt had now locked onto the frame, engine, radiator, oil cooler and pretty much everything else. 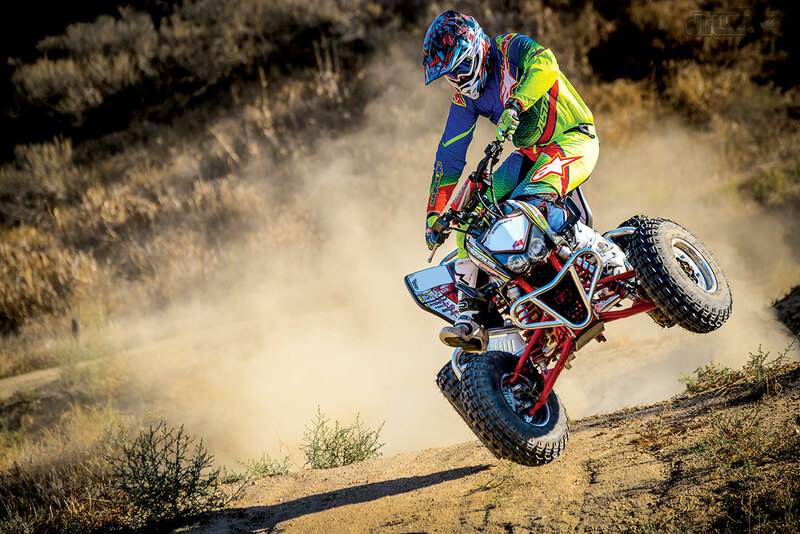 The 2004–2005 Honda TRX450Rs had poor crank bearings from the factory. Honda had updated bearings to remedy this; however, not everyone knew about it until it was too late. This quad actually had met this very fate after a lot of long, hard hours in the dunes and dirt. We could tell after taking the oil filter out and seeing that there was a lot of metal in the filter—a telltale sign that the rod bearings or crank bearings are bad. All of the bearings and bushings on the bike were shot, the plastics were broken, the steering stem was bent, a bumper was bent, the axle was bent, it had stripped rear-wheel studs, bad brakes, the entire clutch was smoked, and the upper gas-tank nut was stripped. Yeah, this ol’ quad needed a lot of TLC and some upgraded parts. After the long process of tearing down the ATV to the frame, it was time to clean all of the parts and get ready for the rebuild. We sent the frame to C and J Powdercoating in Utah for a fresh Fire Engine Red powdercoat job on the frame, sub-frame, A-arms and swingarm. Once we picked up those parts, it was time to replace the bearings, seals and bushings. Using Pivot Works bearings, we installed them into the lower steering-stem mount, wheel bearings, axle-carrier bearings, A-arm bushings and linkage bearings. We’re happy we went with the 480cc big-bore kit from Cylinder Works. It mated very well with the Fastheads head work and created huge power! Next was rebuilding the engine. The cylinder head needed some love, so we sent it to Fastheads for a complete valve-train replacement. After getting the cylinder head back, we installed some serious power with a Stage 3 Hot Cam, 480cc Works cylinder, Vertex piston kit and a Hot Rods crank kit that included updated bearings. It needed a great clutch, so we installed a complete Hinson clutch and their full components. We also added an FMF RCT 4.1 full-exhaust system. The ignition on these years’ TRXs is lacking rpm range, so we added a Dynatek box for higher revs. CRF Racing poly sprocket guard, CRF Racing poly belly pan and Hess Motorsports billet rotor guard keep everything protected on this beast. The Tusk adjustable axle that we used has a lifetime warranty and is inexpensive compared to other brands. We went with ITP QuadCross XC tires and ITP polished standard wheels on the front and polished beadlock wheels on the rear. Tusk provided the stopping power with their brake pads and brake rotors. It needed a straight steering stem, so we went with a +2 Teixeira Tech anti-vibration stem with their adjustable handlebar clamp. Since we stuck with the OEM suspension, we gave the rider a plusher ride with Flexx handlebars and A’ME Tri ATV grips. We then installed a Works Connection full-perch/lever assembly for a smooth clutch feel. For protection, we went with a Campbell Racing Fabrication poly-frame skid plate, along with their poly-sprocket guard and a Hess Motorsports rear rotor guard. We then employed Spider Graphix to create a set of eye-catching graphics to match the frame color. We did have some used parts that we had laying around from over the years, including some used Maier front and rear plastics, an OEM fuel tank, a Rad Manufacturing locking axle nut and a set of Lonestar billet rear-wheel hubs. All of these used parts saved a lot of money in the long run and work just as well as new. Visually, this quad looks amazing and nothing like it did when we started this journey. Riding the TRX480R was even better! 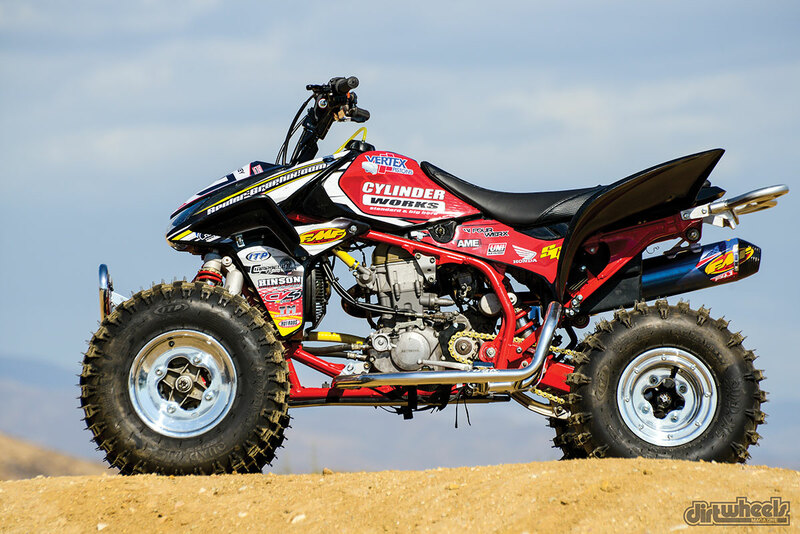 The Cylinder Works big-bore kit really woke up this 2004 TRX450R. The 2004s usually don’t have a ton of power, but, boy, when you hit the throttle now, you better be holding on. Even with all of that power, it was important that it was all rideable power for everyday riding. By adding the Stage 3 Hot Cam and the head work from Fastheads on top of that, it created that smooth power we were looking for. It made for a heck of a good time when coming into a corner and being able to jump a double easily. 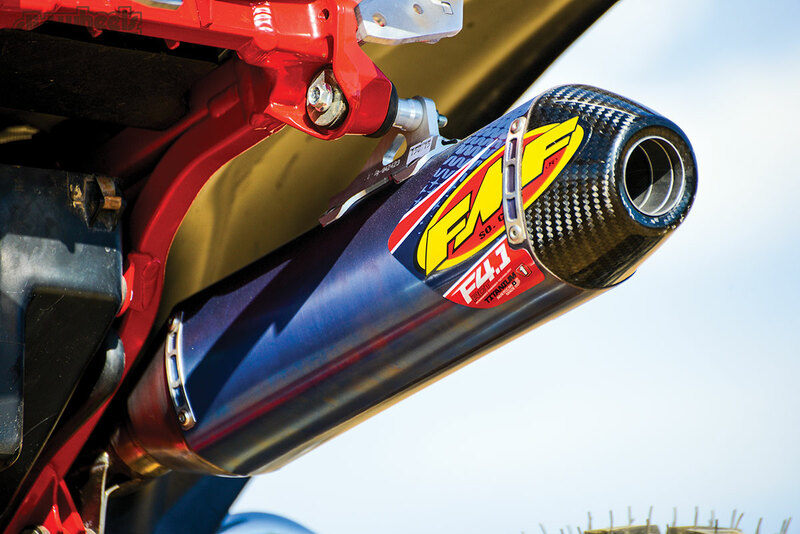 The FMF exhaust gave it a crisp note as we barreled down the track, and, let’s face it, it’s a great-looking exhaust! 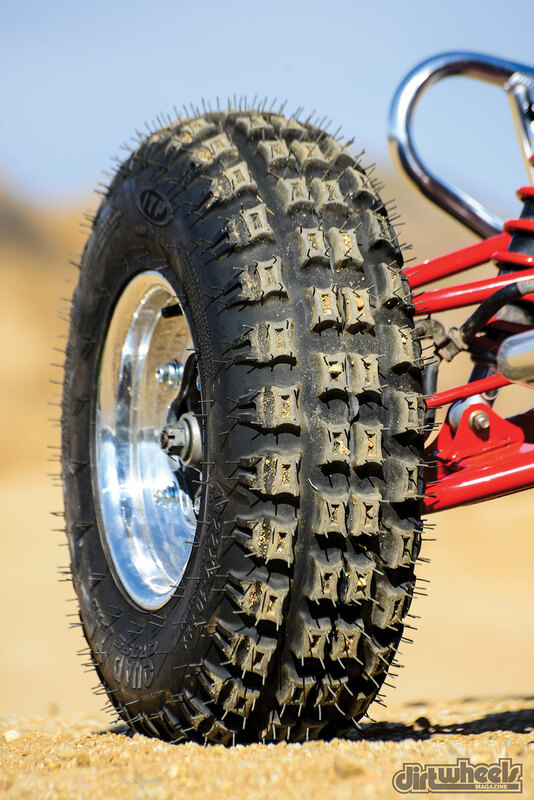 The ITP tires worked very well and gave us a lot of confidence in the traction that we were able to do most of the moto-style jumps and obstacles with ease. ITP provided the wheels and tires for this build. We went with the Quadcross XC tires, rolled-lip polished front wheels and polished beadlock rear wheels. The stock Honda shocks are decent for everyday riding, but it was nice to be able to ride the quad hard and know the Flexx handlebars would soak up any additional feedback we received. We were impressed with the braking power of the Tusk pads and rotors. Coming off of down hills, it stopped the quad very well, and these are a very cheap option for replacements. 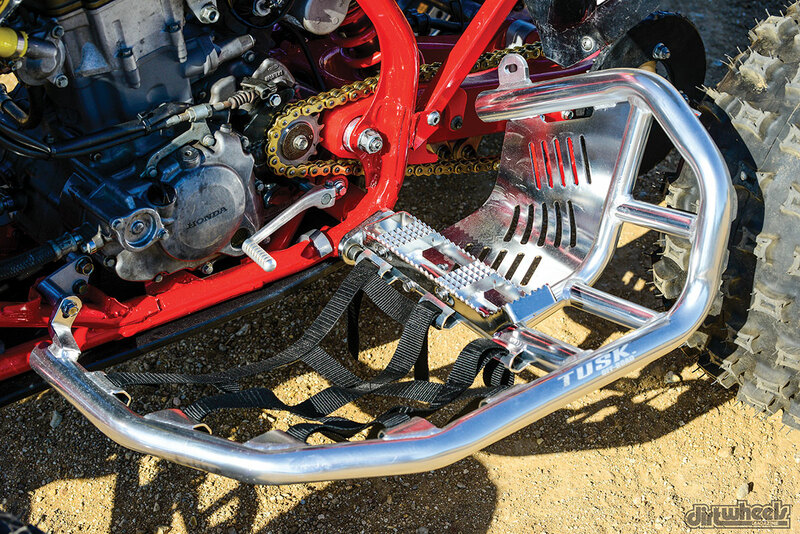 The Tusk nerf bars gave the test riders sure-footing and a good feel while riding. This older TRX was in rough shape when we tore into it. 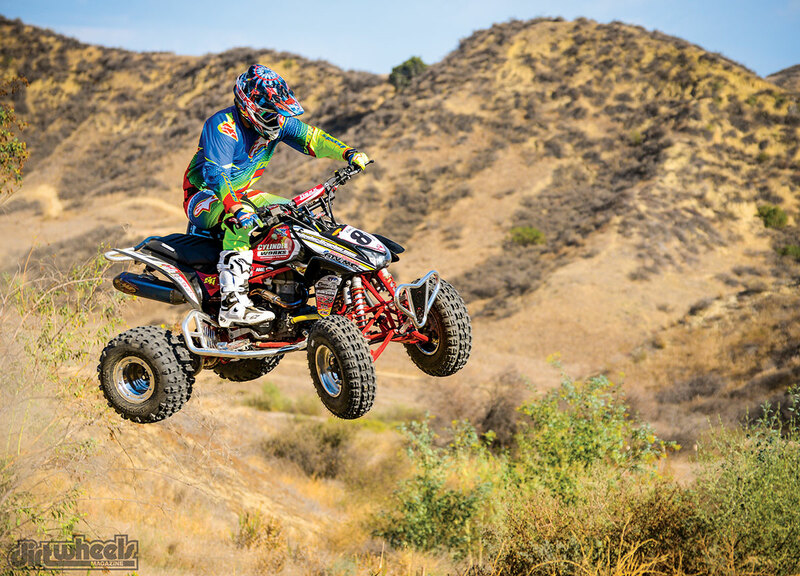 Now it’s an awesome quad that can take on other 450’s and even big quads like the Raptor 700. After completely rebuilding this quad and giving it some love, it really flourished into something awesome! With the big bore, it will outrun most sport quads without hesitation and does it on 91-octane pump gas. 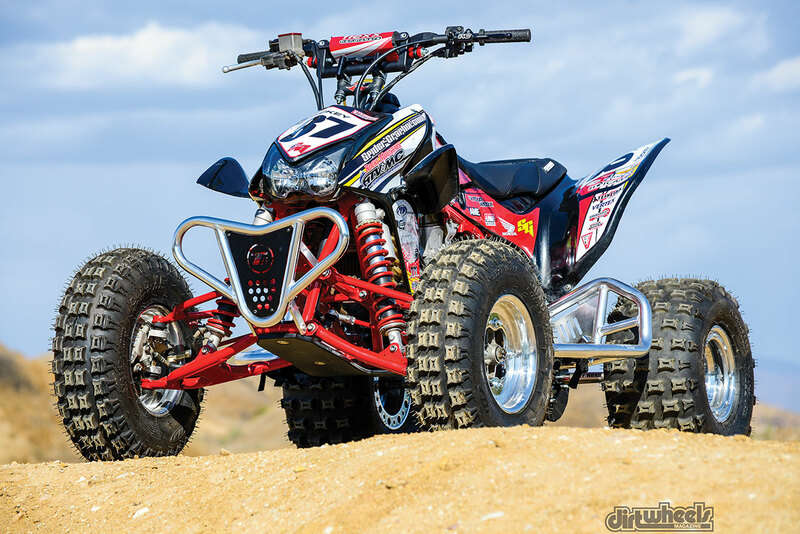 The moral of this story is, even though Yamaha is the only manufacturer producing a 450 sport quad, you can take your older quad and make it better than new. After all was said and done with the parts we installed, the total cost came out to be a little under $8000. We know that sounds steep, and for a lot of us, it is; however, if you can find a 2014 TRX450ER on the showroom floor, it will set you back $7800 retail. The Yamaha YFZ450R will set you even further back at $8899. 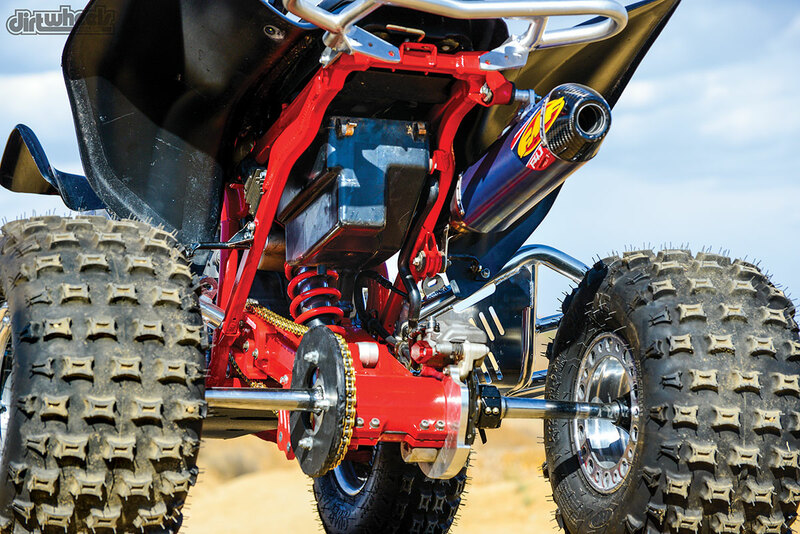 Granted the YFZ450R is wider and has better shocks, but the fact still remains—by adding new parts, you can be the envy of your riding buddies and have them wishing they had the same setup.